Weekends in October -- both Saturdays and Sundays -- Kidtoon Films family matinees presents Chuggington: Traintastic Adventures on the big screen at select local Kidtoons theaters nationwide. Six fun adventures comprise Chuggington: Traintastic Adventures. All the characters that kids love are featured from Brewster testing his latest speedy invention to Koko who uses his stunt training to save the day to Wilson who finds himself stuck on the track lift and his friends pull him out while competing in a hilarious chug-of-war. A heart-warming movie that teaches positive values to little Chuggington fans and a movie that parents will warm up to as well. Kidtoons is also providing a fun-filled 7-piece prize package valued at $45+ for a give away to one lucky Mommy Blog Expert reader -- see How to Enter below for a chance to win it for your child. Don't delay. Enter this mega family-friendly giveaway and be sure to grab your free down loadable Kidtoon Films ticket (one per family) good through 2012 at the Kidtoons theater location nearest you. Plus download as many copies of the two complimentary fun coloring pages for your kids featuring this month's movie as you'd like at KidtoonFilms.com. Just leave a comment(s) below this post. Contest ends November 1, 2012 at 12 midnite PST and is open to legal residents of the U.S. only. 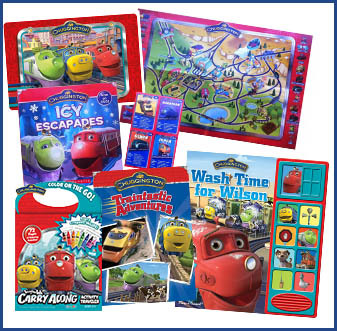 One winner will win the Chuggington: Traintastic Adventures Grand Prize package selected at random from all entries and will be notified via email. Past Kidtoons movie giveaways on MBE include: Spookley Square Pumpkin, Care Bears: Share Bear Shines, Curious George: A Very Monkey Christmas, Barbie A Fairy Secret, Little Engine That Could, Strawberry Shortcake: Sky's the Limit, Olivia and the Great Outdoors, Thomas & Friends: Hero of the Rails, Babar and the Adventures of Badou: Swing Into Summer, Candy Land The Great Lollipop Adventure, Sid the Science Kid, Spookley Square Pumpkin 2011, Thomas & Friends Day of Diesels, Olivia Wintertime Cheer, Dino Dan, Barbie in a Mermaid Tale 2, The Gruffalo, Sid the Science Kid Backyard Camp Out, The Wiggles Big Birthday, and The Gruffalo's Child. FTC Disclosure: Kidtoon Films is providing the prizes and shipping for this giveaway and is offering free movie tickets to MBE readers. MommyBlogExpert did not receive any payment or other compensation associated with this post. See complete FTC Disclosure information that appears at the bottom of MommyBlogExpert's main page and at the bottom of every individual post on this blog, including this one. I would love to win this for my son! These would make awesome Christmas gifts! I want to win this for my son because he is a fan of Chuggington. Thanks! I would love to give this to my son. My son would love, love, love this! We are having a Chuggington Birthday Party for him next week. He loves Chuggington! My son is in love with Chuggington! I'd love to win this as I think my daughter would love it! I want to win this to give to my little grandson. He loves to watch Chuggington on TV. I 'like' Mommy Blog Expert on facebook. I 'like' KidToons on facebook. 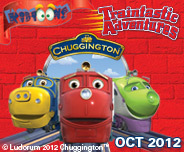 We love Chuggington and would have a fantastic time with this prize! Thank you so much!!!!!!!!!! I follow KidToons on Pinterest! I follow MBE on Pinterest! My 2.5 year old son Mason, LOVES Chuggington. This would make a great christmas present! I would love to win as my son LOVES Chuggington. We are huge Chuggington fans:) My son's big gift this Christmas is the train set!! I think I am just as excited!! I did all of the extra entries!! I would love to win this for my grandson, he LOVES trains! My 4 yr. old son would love to have this! I'd love to gift this to my awesome kids. Id love to win this for my grandson because he love Chuggington! Oh, my godson would just love this! I would give it to him for Christmas! Following you on Twitter @HSMomAdventures. Count me in! My son would love this!